THE WAIT IS OVER! 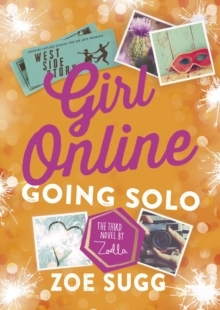 Zoella’s brand new Girl Online book is out now! Penny’s life is back to normal. As Penny starts the school year she’s ready to face the world – alone. Noah has gone off the radar after ending his world tour early and no one, including Penny, knows where he is. So when she accepts Megan’s invitation to visit her performing arts school it seems like an opportunity to make some new friends. Helping everyone else seems to be the right remedy. Elliot needs her friendship more than ever, and she meets Posey – struggling with stage fright and in need of support. But is charming Scottish boy Callum the right kind of distraction? And can Penny truly move on when Noah’s shadow seems to haunt her round every corner? Book three in the number-one bestselling Girl Online series.